Ever wanted to know more about some of the great LED flashlights we offer? Well, you’re in luck! This month, we’re shining our spotlight on the Streamlight Stylus Pro flashlight. This sleek, pen-sized flashlight is perfect for people who need a bright, convenient-to-use flashlight. It’s been developed to help professionals and sportsmen perform various tasks without the bulk of other flashlights. This little LED flashlight packs a big punch. Using C4 LED technology, the Stylus Pro doesn’t make you sacrifice product life for a small flashlight. It is estimated to last 50,000 hours. At peak beam intensity, the light from the Stylus Pro has been measured at 1,033 candelas with a measured output of 48 lumens. 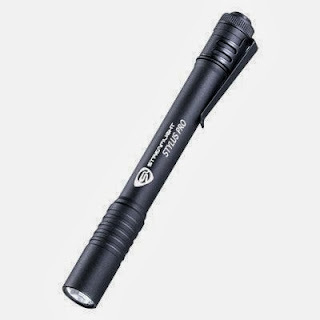 In addition to its amazing brightness, this flashlight offers tremendous runtime for such a small tool: The Stylus Pro can run for 6.25 hours on only two AAA batteries. This tiny flashlight is super durable, too. One of the qualities of the Stylus Pro that impressed us the most was how easy it is to use. Its push button tail switch allows for momentary or constant on operation, perfect for whatever your application. What do you think about this bright LED flashlight? Leave us a comment! We’d love to know.